Carmel, Indiana is north of Indianapolis. It lies in Hamilton County and has an approximate population of 85,000. US 31 and Keystone Parkway go through the city, and Interstates 70,69.65, and 465 are easy to access from Carmel. The city is committed to controlled expansion and is prudent in its planning. The area was first inhabited by the Delaware Indians. Quakers settled the area during the presidency of Andrew Jackson. The first store was built in 1837. The town was incorporated in 1874. This thriving subdivision of Indianapolis is home to the Carmel Arts & Design District. You’ll find interior designers, specialty shops, and art galleries. The Carmel Clay Historical Museum is a great visit for railroad lovers. It can be found in the Monon Railroad depot which was built in 1883. Besides the many displays of railroad memorabilia and artifacts, there are many exhibits of local history. The Carmel Clay Veterans Memorial pays its respect to veterans with a bronze military sculpture by William H. Wolfe an Indiana artist. The Center for the Performing Arts is quickly becoming a gathering spot for people in the community to enjoy good theater. Outdoor lovers won’t be disappointed in the parks in this diverse city. Central Park is 161 acres of trails, wetlands, fishing opportunities, gardens and special events. The Monon Greenway, which was the Monon Railroad in the past, serves the community as a trail for runners, bicyclists, walker and those who love to explore and observe nature. 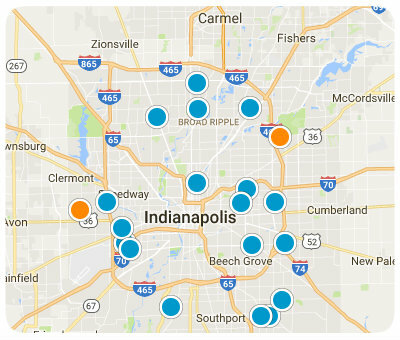 In total, there are 12 parks in the Carmel Clay Parks and Recreation system. The diverse real estate in Carmel ranges from older cottages to modern luxury homes. Whether your style is brick ranch or vinyl traditional homes in the established neighborhoods, or the larger, new homes, you’ll find something to match your style. With attractive neighborhoods and plenty of things for the family to take part it, it is known as a top city to raise a family. The schools are ranked some of the highest in the state, and the unique shops and cultural aspects of the city combine with easy access to Indianapolis or surrounding subdivisions, make it a must consider destination for home buyers in the Indianapolis area. If you would like more information homes for sale in Carmel, Indiana, please contact us today and allow us to assist you. Listing courtesy of Honor Realty Llc. Listing courtesy of Viewpoint Realty Group, Llc.